As a presbyterian and reformed church, our local church government is composed of the ordained offices of minister, elder, and deacon. “Those who share in the rule of the church may be called elders (presbyters), bishops, or church governors. Those who minister in mercy and service are called deacons. Those elders who have been endued and called of Christ to labor also in the Word and teaching are called ministers” (BCO FG V). Pastor Reid Hankins was born and raised in Bellflower, CA. He received his bachelor’s degree in Computer Science, with a minor in Classical and Medieval European Studies, in June 2000 from the University of California, San Diego. In February 2003, Pastor Reid started Hankins Consulting, Inc., a web development consulting company. He continued to operate his business throughout his seminary training at Westminster Seminary California, graduating in June 2007 with a Masters of Divinity (M.Div.) degree. 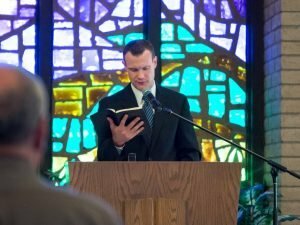 During his seminary studies, Pastor Reid was distinguished to receive the Samuel and Ann Van Til Scholarship Prize in Biblical Studies and the Arthur Forest Wells Memorial Scholarship. He has been married to his wife Kim since 2001, and they have two children. In his free time, Pastor Reid enjoys ice hockey, hiking, camping, fine dining, and playing board games.